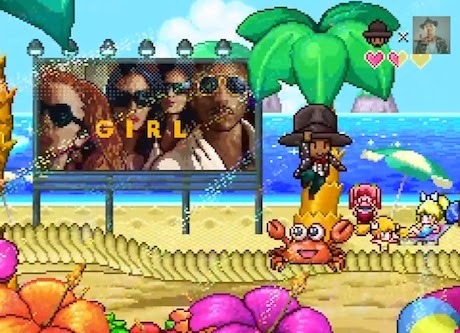 Pharrell Williams has premiered his new music video for the latest single "It Girl" from his sophomore studio album "G I R L."
The singer-songwriter/producer/fashion designer sought out famed Japanese contemporary artist Takashi Murakami to help with the video. Murakami is known for his colorful creations as well as an ongoing collaboration with fashion designer Louis Vuitton. Murakami used his production company Kaikai Kiki to make the colorful visual. The video is co-directed by Mr. Fantasista Utamaro and animated by NAS. In it, Skateboard P and his Vivienne Westwood signature hat, which he famously wore to this year's Grammy Awards, are transformed into a Japanese anime and video game character. Accompanied by the catchy track, "The Voice" coach follows a group of bikini-clad teenage schoolgirls to the beach and wanders the streets of Tokyo to see the psychedelic sights. There is lots of skateboarding and volleyball and the like. At one point, he buys a brand new kimono and a bunny purse for his classic anime 'It Girl' and takes her and her friends off on a dolphin spaceship to win her heart. It is all about a youthful vibe with fun things going on. Mr. Williams previously explained his mindset full of such neon-colored pop-up quotes, pixelated imagery, cartoon graphics and video game scenes. "I needed color. Everybody else was like steel, minimal," he told New York Magazine. "I was like color, rainbow, many different versions of the rainbow. Rainbow, but tertiary colors, not primary. Rainbow, gingham print. Polka dot. Color, color, color." Pharrell is currently finishing his "Voice" co-judge Gwen Stefani's third solo album. "You gotta hear this new Gwen record," he told MTV News. "When I tell you she's killing it, it's another level. Gwen is somewhere else." "It Girl" is the fourth single off Pharrell's second LP "G I R L," following smash hit "Happy," "Come Get It Bae" and "Marilyn Monroe."